In this activity a Chinese language student from NOVA and an English language student from China will meet and talk, first in Chinese for at least 5 minutes and then in English for at least 5 minutes. Besides developing a greater proficiency in the language you are studying, you should develop a deeper understanding of the other student’s culture and lifestyle. This handout assumes that you are starting at the Landing Site on the NOVA campus in Second Life (see image below). Your language professor should have provided you with a separate handout that told you how to download the Firestorm program we use for Second Life, how to get an avatar, how to visit an orientation site, and how to get to the landing site on the NOVA campus. Whenever you wish to exit Second Life, left click on the white X in the red box on the top right of your screen. 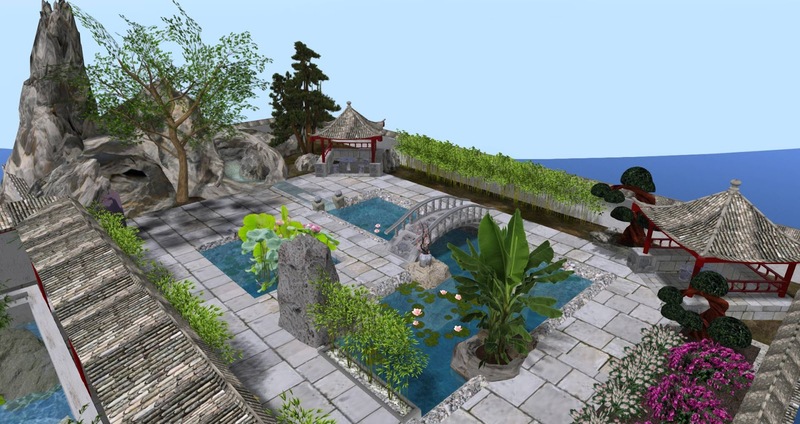 When you return to Second Life, your avatar will appear at the same location it was when you logged off. 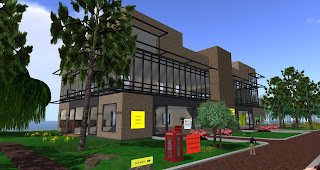 Moving around the virtual campus is easy. The red telephone booths are teleporters that move you to the different locations on the campus. Left click on the red telephone booth and you should find your avatar inside the booth and a menu of different locations appears on your screen. There are 3 pages of locations and you can use the arrows at the bottom of the menu to go between pages. 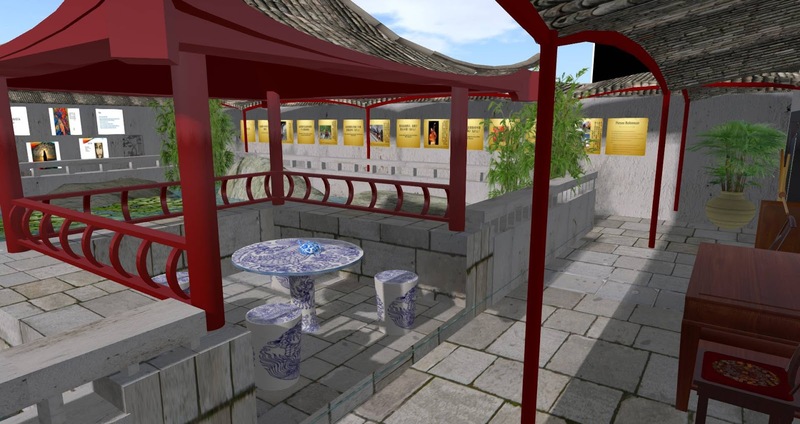 Left click on the location named Lang Center and you will find yourself at the Chinese Garden location (see image below). You are now on a platform 300 meters in the air. To return to the ground, simply left click on the red telephone booth there and select Main Landing. 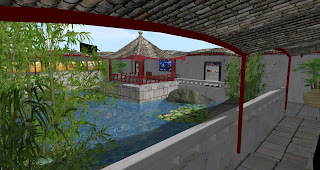 You should find yourself inside a walled garden area with a large pond with goldfish in the middle. There is a walkway around the edge of the pond and garden. Across the pond from where you landed is the tea house where you will meet. Walk around the edge of the garden until you get to the tea house area (see first image on page below). In the tea house area are a table and four chairs all made of porcelain (see second image on page below). The first thing to do is to sit on a chair. Left click on the edge of the chair and you will be sitting on the chair. If you clicked on the right edge, you will be sitting facing the right. If you click on the left edge, you will be sitting facing the left. If you clicked on the front edge you will be sitting facing the table. Try to sit facing the table and facing the other students who you will me meeting with. In the middle of the table is a tea pot. Left click on the tea pot and a menu with three options appears on your screen. Select the far right option “Glass.” This will place a cup of tea in your Recent file in your Inventory. To get the cup of tea, left click on the suitcase icon on the bottom toolbar. This opens your Inventory menu. At the top of the inventory box are several options, one is Recent. Click on Recent and then click on objects. You should now see the words Iv4cha2-he1 next to a yellow cube. Right click on the yellow cube and select wear and you should now have a cup of tea in your hand. 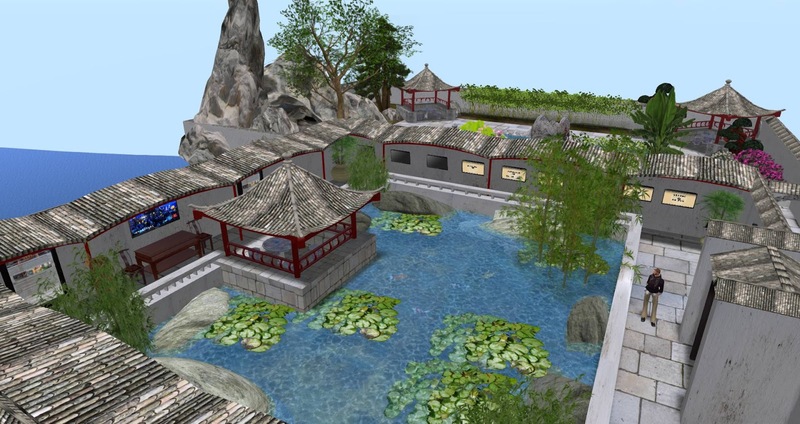 If more than one group of students is using the formal Chinese garden area, there are two other areas for students to meet and talk in the garden outside the gates of the formal garden (see image below). To go to these meeting areas, go out the gate from the formal garden. If the gate doors are closed, left click on them to open them. Once out the gate, go to your left out through the moon gate into a large garden area. If the two far corners of this garden you will find place to meet and talk. There are three ways to communicate with someone in Second Life: nearby chat, IM (instant message), and voice. With nearby chat and voice you can only communicate with people who are close to you (within 20 meters) and you are communicating with everyone who is nearby. With IM you communicate only with the one person you selected and there is no distance limit. Both nearby chat and IM create a text record that you can highlight, copy, and paste into a Word document. Your professor might have asked you to use one of these modes and if so, please use that one. To use nearby chat, left click on the words Nearby Chat on the far left of your bottom toolbar. This opens up a chat box. You can enter text in the box and then click on the Enter Key to post your message. You can copy text from another document and paste the text into nearby chat. There, however, is no way to erase this text once you post it. Because IM is between you and one other person, you must first select the person you wish to communicate with. There are two ways to do this. If the person is near you, you can right click on their avatar and in the menu that appears select IM. You should see an IM window appear on your screen where you can type text in IM. If the person is on the same region as you (e.g. the NOVA Campus) but not near you, then you can left click on the People icon on the bottom tool bar (looks like two people standing together). This gives you a box with several options across the top. You want to select the Nearby option, which shows you all the avatars that are in the same region as you. It also tells you how far away they are. To IM with a person on the Nearby list, right click on the person’s name and select IM from the dropdown menu that appears. You should see an IM window appear on your screen. In voice mode you speak into a microphone and as long as the other people have speakers they can hear you. In this mode you can carry on a normal speaking conversation. If you have a lot of background noise it can be heard and be annoying for those listening to you. So be sure you are in a quiet place. So check with the other students and if everyone has a microphone and speakers (most laptops today have these) you can use the voice option. First check that your sounds setting are okay. To do this left click on the speaker icon on the far right of your top toolbar. You will see a box appear that allows you to set the volume for different sounds. Make sure the master (on top) and voice settings are full on. Also make sure the sound on your computer is not muted. Now you are ready to activate the voice mode. Find the microphone icon usually on the left side of the bottom toolbar. Left click on this icon. Note that there is a small box in the upper right corner of this icon, left click on this small box also. Now your voice mode should be on. You should see a green dot over the head of your avatar and when you speak, green waves appear from this dot. To stop your microphone, simply left click on the small box again. Then no one can hear you. Finally, whenever you are ready to log off, click on the white X in the red box, top right corner. Now you are ready to communicate with another student from another country and speaking a different language. This is an opportunity to learn to appreciate the similarities and differences of people from different cultural and linguistic backgrounds. The goal is to talk at least 5 minutes in Chinese and then at least 5 minutes in English. If your professor gave you specific instructions, then please follow those. Otherwise, you will be using nearby chat to communicate initially. Use Chinese characters when communicating in Chinese and the English alphabet when communicating in English. 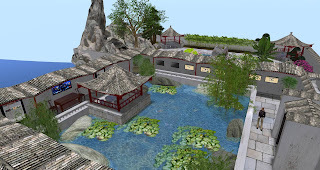 For the students studying Chinese, after you are finished communication in Chinese, copy and paste the Chinese nearby chat into a Word document. You will attach this Word file to an email and send it to your professor. For students studying English, after you are finished communication in English, copy and paste the English nearby chat into a word document. You will attach this Word file to an email and send it to your professor. After you have communicated in Chinese for 5 minutes and in English for 5 minutes, feel free to open the voice mode and chat in voice. Below are some suggest topics to help you get started conversing with the other student. These are just suggestions and feel free to use other topics or move beyond these topics. Hi! My name is---; I am student from NOVA. I am from ---country. Nice to meet you! 你爸爸妈妈做什么工作？What do your parents to as a profession? 你喜欢什么运动？What sports (or kinds of physical exercises) do you like? 你最喜欢什么菜？What is your favorite food dish? 你最喜欢哪个电影？What is your favorite movie? For Chinese 201 and 202 can add. 你是在哪儿长大的？Where did you grow up? 你最喜欢哪个季节？春天，夏天，秋天还是冬天？What is your favorite season? Spring, summer, autumn or winter?